In 2009, DJ Quik took an unexpected snippet of Andrew Zimmern’s hit show and flipped it into an instant party starter. Here’s how he did it. Compton native and veteran producer DJ Quik knew the Death Row duo of Daz Dillinger and Kurupt was going to hit it big when he heard “Sooo Much Style” and the rest of their 1995 Dogg Pound debut Dogg Food. His appreciation Kurupt’s talents reached another level when the veteran MC signed with A & M and dropped the Battlecat produced “We Can Freak It” in 1998. As the years passed, Quik felt a growing admiration for the veteran MC’s ever-improving skills as an MC. “I never lost that respect for him — he makes records that get better with time,” he told the L.A. Times. The two artists moved in similar creative circles and collaborated several times in the years following “We Can Freak It” and Kurupt’s subsequent album Kuruption!, with Quik providing a track for Kurupt’s 2001 Space Boogie: Smoke Oddessey as well as his 2007 collaboration with J. Wells Digital Smoke. They decided to build on their noticeable creative spark by making an entire project together after they joined forces again in 2008 for “Press Play” on Snoop’s Ego Trippin’. 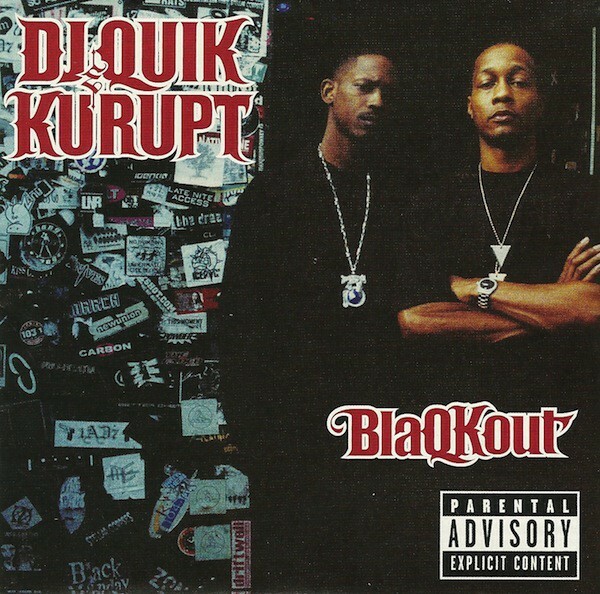 The creation of the resulting 2009 album BlaQkout required careful coordination of schedules, as Kurupt was balancing multiple projects with a hectic tour schedule at the time. “Kurupt was on tour with Snoop, working on his album Street Lights, and working on BlaQkout with me and knocked out BlaQkout in just a few months,” Quik told SoundHustle.com in a 2009 interview. The Morocco episode of ‘Bizarre Foods’ (sample starts at 23:20). In the spirit of keeping an unusual vibe, Quik decided to flip the Morocco episode of Bizarre Foods with Andrew Zimmern for the single “Hey Playa (Moroccan Blues)” while he was watching TV one day. According to Quik, he knew he had a potential hit on his hands as soon as he heard the sample. “I’m watching it and I heard that little sound bit and I rewound it and was like, ‘Oh my god, here we go again. Here’s another dance record!’” he told SoundHustle.com. Quik also appreciated the way food and music work together Moroccan culture. “The food inspires that music and the music inspires that food,” he told DubCNN in a 2009 video interview. Connect with DJ Quik on Facebook, Instagram, and on Twitter @djquik. Connect with Kurrupt on Facebook, Instagram and on Twitter @kurupt_gotti.